Well, he left Wisconsin for the academic standards. Wonder why he decided to bail on Oregon State. Hopefully, it's not family or health-related. Maybe it was some kind of behind the doors spat. Weird that it happened in the middle of the season. I would imagine it has something to do with his 7-23 record overall, being 1-5 this season with the only competitive game being the Portland State game, and the fact that both the offense and defense are ranked in the bottom 3rd in the country. (10-09-2017 02:30 PM)Kaplony Wrote: I would imagine it has something to do with his 7-23 record overall, being 1-5 this season with the only competitive game being the Portland State game, and the fact that both the offense and defense are ranked in the bottom 3rd in the country. Leaving Wisconsin to go 7-23. Has job hopping ever flopped any harder? If Mike Riley gets dismissed from Nebraska, could a third reunion be on the horizon? (10-09-2017 02:14 PM)GoldenWarrior11 Wrote: Well, he left Wisconsin for the academic standards. Wonder why he decided to bail on Oregon State. Hopefully, it's not family or health-related. If this were something health or family related I think they would have worded the statement differently. This seems more like a "part company" or get fired thing. Bet he wishes he was back in Madison. Had it pretty good there. (10-09-2017 02:40 PM)BadgerMJ Wrote: Had it pretty good there. Probably reminded everyday about his boss and who he was to that program. That isn't pretty good at all. He had it best at Utah State. I'd wager there's a school that's really close to the church out there in Utah that's calling to him very soon, if not already. 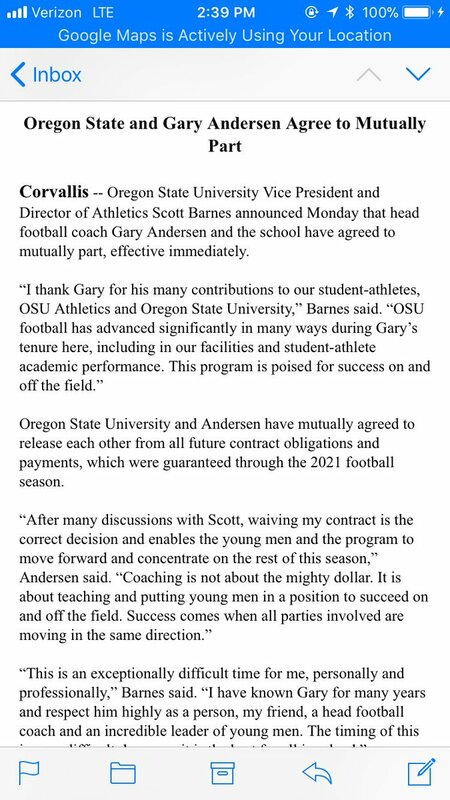 Andersen gave up over $12 million in order for both he and OSU to part ways. He could have fought for and likely received a substantial portion of that fee which was due through 2021. Pretty classy move on Andersen's part. How often to coaches forego remainder on deal? (10-09-2017 02:52 PM)GoldenWarrior11 Wrote: Andersen gave up over $12 million in order for both he and OSU to part ways. He could have fought for and likely received a substantial portion of that fee which was due through 2021. Pretty classy move on Andersen's part. That is the strange part. He left a lot of money on the table. Sitake leaves Oregon State to go to BYU. Anderson leaves Wisconsin to go to Oregon State. Both flounder in their spots, but, perhaps, take on Anderson to consult, and see where it goes? I know he focuses on the defensive side of the ball...but, does he have any OC experience? Asking for a friend. He started coaching on that side of the ball, as OC for SELA. He's also got experience with special teams. He and Sitaki have worked together in the past, for Southern Utah and UU. (10-09-2017 02:52 PM)The Cutter of Bish Wrote: Probably reminded everyday about his boss and who he was to that program. That isn't pretty good at all. I know the history well. Anderson also helped to breathe new life into the BYU-Utah State rivalry. BYU fans would love it if Gary Anderson was involved to help save BYU's football team this year and in the future. Experience is a key weakness in our coaching staff. How do we know what transpired behind the scenes with some rich donors etc. Just sayin. Very surprising considering Barnes hired him at Utah State. I know a lot of USU fans want him back. Look for G5 coaches and P5 coordinators to be updating and mailing their resumes. 3. Next up? Your guess? Help wanted signs are up on three schools right now. Ole Miss. dismissed theirs before the season started. (10-09-2017 02:35 PM)GoldenWarrior11 Wrote: If Mike Riley gets dismissed from Nebraska, could a third reunion be on the horizon? I wonder which happens first - Mike Riley bolts back to Oregon St or Nebraska fires him. I really hope they get a 3rd reunion. Mike Riley/Oregon St is one of my favorite coach/school relationships.